My most indelible memory of the holiday we Americans call Veterans Day happened 46 years ago when Jan and I passed through Checkpoint Charlie into East Berlin. We were journalists in Frankfurt at the time but had business in Berlin and decided to take in the sights on Saturday, Nov. 11, 1972. This was eleven years after the Berlin wall. Checkpoint Charlie wasn’t much more than a shed in the middle of the road, with a prominent sign to the side that warned you were leaving the American sector of Berlin. Across the border in East Berlin, however, security was a different story. There was a building much like passport control at the airports of the day — a narrow corridor you had to pass, with scowling immigration officers along the way. Think back to one of its earliest film depictions, in The Spy Who Came In From the Cold. It was there that we had the experience that made Veterans Day stand out. A young VoPo (for Volkspolizei) officer with bad dental work was asking all the Americans who came through about the holiday they were observing that day. He was suspicious that it was a triumphal World War II victory celebration, but he spoke no English and the people he’d asked spoke no German, so he’d learned nothing. His attitude softened considerably when we explained that it was a holiday in honor of all American military veterans. That made him smile but didn’t stop him from rifling my wallet in search of contraband. If we hadn’t been alert he might have found some. A friend who lived in our apartment building in Frankfurt had family in East Berlin and asked us to take them some West German marks, if we could do it safely. But whatever you do, she warned, memorize the name and address. Don’t carry it through the checkpoint. It was good advice. There’s a sidelight to the story. Our landlady in Frankfurt, who did a thriving business renting apartments to Americans, was Frau Wetzmuller, a name you’ll recognize if you read Treasure of Saint-Lazare closely. 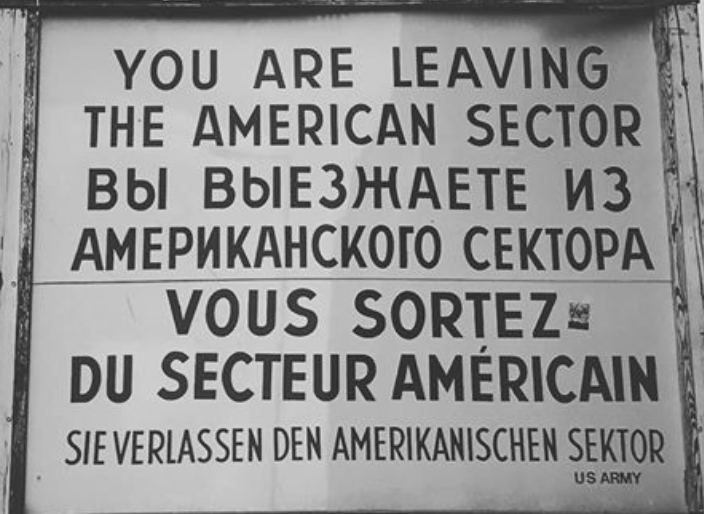 The unmissable warning at Checkpoint Charlie.